In the fall of 1956, William X. Scheinman, a twenty-eight-year-old industrialist, jazz enthusiast, and philanthropist, attended a lecture in Manhattan by twenty-six-year-old Tom Mboya of Great Britain’s Kenya colony, whose lecture tour Scheinman had helped underwrite for the American Committee on Africa. This particular lecture was a dud. Scheinman figured Mboya was exhausted after giving dozens of lectures in a few weeks about Kenya’s prospects for independence. Introduced to Mboya backstage, Scheinman asked if he had ever visited Harlem. Mboya had not, and so Scheinman, a former publicist for the Count Basie band, took him uptown. They talked all night. Scheinman and Mboya soon began to correspond. Their friendship would continue for the rest of their lives and deeply influence each other and the futures of their countries. Together they would form the African American Students Foundation (AASF), which would bring eight hundred East Africans to the United States for college study, almost all of whom later returned home to build their countries in the first flush of those countries’ independence. Among those helped by the AASF were Barack Obama Sr., father of the future U.S. president, and 2004 Nobel Peace Prize laureate Wangari Maathai. 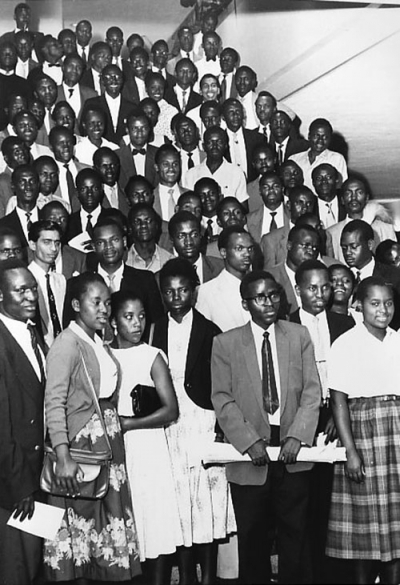 Eighty-one students arrive in New York in 1959, after the first flight to bring East Africans to study in the United States. Knowing that an independent Kenya would require well-educated native bureaucrats, educators, businessmen, doctors, lawyers, and engineers, Kenyans and their American allies arranged for the airlifts. The flights made possible the education of a generation of future nation builders. The friendship of Mboya and Scheinman and the history of their African American Students Foundation are recorded in hundreds of letters, telegrams, and reports in the Hoover Archives’ recently opened William X. Scheinman papers. The firstborn son of a sisal plantation overseer, Tom Mboya had studied to become a “sanitary inspector” of milk and other agricultural products. While working in that capacity for the Nairobi city government, he rose in the union hierarchy. It was the time of what white settlers called the “Mau Mau uprising”; Africans labeled it an anticolonial independence movement. The colonial government declared an emergency and jailed tens of thousands of suspected Mau Mau, mostly members of the dominant Kikuyu ethnic group, along with such politicians as Jomo Kenyatta. A ban on Kikuyu participation in politics aided the rise of Mboya, who belonged to the Luo ethnic group. Charming, fluent in five African languages as well as English, Mboya understood “how harmful to Kenya was the man who saw only good in his own people and only evil in those of the other tribes,” as he would write in the autobiographical Freedom and After. Working across tribal and racial lines, he averted national strikes, which led to an invitation to attend Ruskin College at Oxford. There he wrote The Kenya Question: An African Answer, advocating a steady march toward independence, democracy, and capitalism. The pamphlet’s popularity, coupled with Mboya’s increasing reputation as a speaker, led to his American lecture tour. Bill Scheinman, the second son of a doctor, dropped out of the Bronx High School of Science at sixteen to join the Navy, taking a new middle initial, X, to distinguish him from others in his squad whose initials were also WS. After World War II he attended the University of Kansas, then spent two years as a professional gambler and a publicist for Count Basie. Starting an airplane parts firm, Airnav, with a few hundred dollars, he obtained government contracts lucrative enough to quickly make him a millionaire. Interested in social justice, he contributed to and was asked to join the board of the American Committee on Africa (ACOA), which included many respected civil rights activists and was led by Protestant minister George Houser. Frank Montero, an African-American real estate entrepreneur and an executive of the National Urban League, became Scheinman’s closest friend on the board. During Scheinman and Mboya’s all-night session in Harlem, they discovered similar beliefs about the need for American-style democracy and capitalism in emerging African states. Africa was a series of battlegrounds in the Cold War, and Soviet influence was rising; in such colonies as the Gold Coast (which became independent Ghana in 1957) and Tanganyika (to become independent Tanzania), the triumph of democracy and capitalism were far from assured. 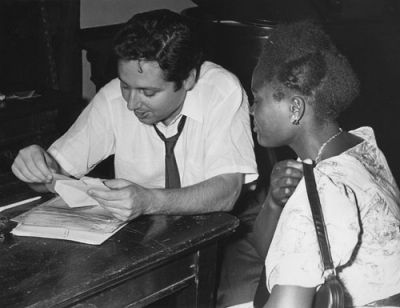 Bill Scheinman, shown counseling a student at the 1959 orientation, was a former professional gambler, a publicist, a jazz enthusiast, and a millionaire industrialist who in the late 1950s threw his support behind social-justice causes. On May 17, 1957, Mboya reported to Scheinman that he had become the de facto leader of the African elected members, but had also begun to be attacked in the press. Over the next years, Scheinman continued to push Mboya and compatriots to “lay down a specific, step-by-step program and timetable covering the major outstanding issues such as redistribution of the land, constitutional reform, etc., and ending with the complete attainment of freedom,” and made detailed recommendations, many of which were ultimately adopted. but also because I know that you are a leader who will not compromise for reasons of expediency or personal advantage. In the midst of the atomic age and the Cold War perhaps the world at large needs the idealism that is present in the struggle now taking place in Africa. . . . History has placed a particularly heavy burden on your shoulders because it would seem that the manner in which the situation in Kenya works out will also determine the future of all of East, Central, and South Africa—and wherever a settler minority presently dominates. Between 1956 and 1958, Mboya frequently requested that Scheinman buy airplane tickets for individual Kenyans who had won scholarships to American colleges but lacked money for airfare. Happy to oblige, Scheinman spent $15,000 for that purpose and also acted as a mentor to the students, corresponding with them, housing them, and hiring them for summer work in his New Jersey factory. This led, in late 1958, to the formation of the African American Students Foundation. Africa was a series of battlegrounds in the Cold War, and Soviet influence was rising. 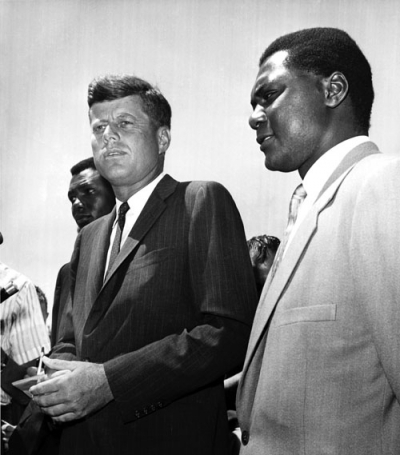 Democratic presidential candidate John F. Kennedy meets with Tom Mboya, right, at Hyannisport in July 1960. Scheinman flew Mboya to this meeting in his own plane. During the hard-fought 1960 campaign, Kennedy’s camp emphasized his support of the student airlift in African- American newspapers. President Kwame Nkrumah of Ghana had convened a first pan-African conference in Accra, and made Mboya conference chairman, a great honor. Scheinman and Houser, attending for the ACOA, met in Accra in December 1958 with Mboya and Gikonyo Kiano, a Berkeley graduate, to discuss bringing many more East African students to the United States. The best and most economical way, Scheinman suggested, was to charter a plane. The AASF would underwrite that charter, shepherd the students to their college destinations, and help them during their stays in America. Mboya, Kiano, and Kariuki Njiiri would choose the students. Returning to New York, Scheinman asked Frank Montero to assist, and he in turn recruited labor lawyer Theodore W. Kheel, president of the National Urban League, and, as student liaison, young Cora Weiss, wife of ACOA board member Peter Weiss. Cora Weiss would later serve as the organization’s executive director. Future Supreme Court justice Thurgood Marshall, left, had a strong interest in fostering democracy in Africa. Here he attends a session of the Kenya Constitutional Conference, which crafted a constitution for Kenya to use when it gained independence in 1963. 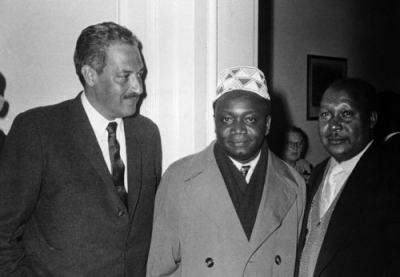 Marshall was a legal adviser to the Kenyan delegation, led by Tom Mboya, who was impressed with the American’s courtroom success in pursuing civil rights. Scheinman underwrote Marshall’s participation. The Nairobi and New York organizers knew very well why the “airlift” was necessary. The British colonial educational system, a terribly narrow pyramid, produced only a few hundred high school graduates every year from a population of 6 million Kenyans, and then sent only a dozen or so on to higher education. Higher education had to be done abroad because East Africa had no true colleges, only a technical institute in Uganda. An independent Kenya would require a cadre of well-educated native bureaucrats, educators, businessmen, doctors, lawyers, and engineers; in Ghana, because such a cadre did not exist, Nkrumah had to retain many white colonial administrators. The willingness of American colleges to offer scholarships to East Africans made it possible to educate a generation of future nation builders, even in the teeth of resistance from Great Britain. Because of that expected pushback, Scheinman, Mboya, and associates also knew that the airlift must be undertaken privately rather than by the U.S. government, because the Eisenhower administration was understandably reluctant to sponsor a program that went against the wishes of its closest foreign ally. “I know that you are a leader who will not compromise for reasons of expediency or personal advantage,” Scheinman wrote to his friend. Scheinman and Montero, unable to decide which of three African-American “entertainers”—singer Harry Belafonte, baseball player Jackie Robinson, or actor Sidney Poitier—should be asked to sign a letter requesting donations for the airlift, opted to ask all three. They agreed to sign together; this was a triumph, Scheinman wrote Mboya, because “they rarely, if ever, allow their names to be used for fundraising purposes.” The letter brought in enough money to charter the plane. Robinson, retired from baseball, also agreed to underwrite the expenses of several Kenyans, and to have the AASF administer those scholarships. Martin Luther King Jr. and groups in New York City, Pittsburgh, Chicago, and Berkeley pledged to provide room and board for groups of students during their stays in the United States. Among the Kenyans considered for AASF assistance, Mboya wrote to Scheinman on July 16, 1959, were “two for Hawaii.” One of those—although Mboya did not mention him by name in the letter—was a fellow Luo named Barack Obama. Because Obama was going to Hawaii, he would not be on the plane with the eighty-one going to New York, but thereafter in Hawaii would receive one of the Jackie Robinson scholarships and additional small grants from the AASF. Mboya and Scheinman were adamant that this must be a self-help enterprise. The students had to obtain their own scholarships, and, to satisfy U.S. visa requirements, each had to raise $300—an amount far in excess of the average East African annual family income. In order to obtain this cash, students usually sought and obtained help from their neighbors and communities. The eighty-one were drawn from ten different Kenyan tribes, plus one student each from Uganda and Nyasaland. Among them were a Maasai, a former Kikuyu schoolteacher jailed under the “emergency,” and a home economics teacher, one of thirteen female students. Meeting the plane, the American press was keen to know whether Geoffrey ole Maloiy had killed a lion to become a Maasai warrior, and why eight students would choose to attend a small, historically black college in Little Rock, city of recent headline-grabbing struggles with segregation. “I want the experience,” one said. “It might be useful when I go back home.” As with many others on the plane, the eight would matriculate at a relatively low-ranked college. Eventually, most of the airlift students transferred and worked their way up through the American college system; several of the eight emerged with doctorates. The willingness of American colleges to offer scholarships to East Africans made it possible to educate a generation of future nation builders. Seventeen colonies in Africa were to become independent in 1960, but Kenya would not be among them, the British still refusing to cede power. However, progress was expected at a Constitutional Conference in London scheduled for January 1960. Believing that Mboya and his fellow Kenyan delegates would need a helping hand from the U.S. civil rights movement, Scheinman recommended Thurgood Marshall, chief counsel for the NAACP and one of the foremost constitutional lawyers of his day. Scheinman underwrote Marshall’s participation and accompanied Marshall to London. The conference, and the future Supreme Court justice’s work on it, was later credited as essential in outlining the steps by which the British worked with the Africans toward full Kenyan independence. 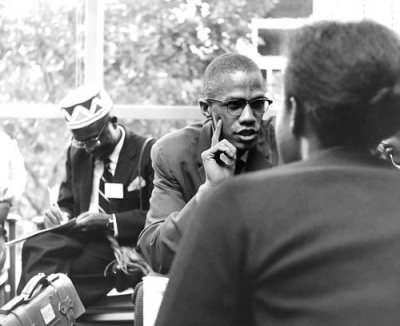 Malcolm X, the public face of the Nation of Islam, talks to the African students in 1960 in New York. Students in this second airlift were introduced to a variety of prominent Americans, including African-Americans who had conducted sit-ins in the segregated South, college presidents, and politicians. The success of the 1959 airlift allowed the AASF to dream of bringing over three or four planeloads of East Africans in 1960. A letter asking several hundred U.S. colleges for scholarships, sent out by the AASF over the signature of Mrs. Ralph Bunche, wife of the 1950 Nobel Peace Prize laureate, was answered enthusiastically and positively. Many institutions of higher learning were now eager to have East Africans on campus. 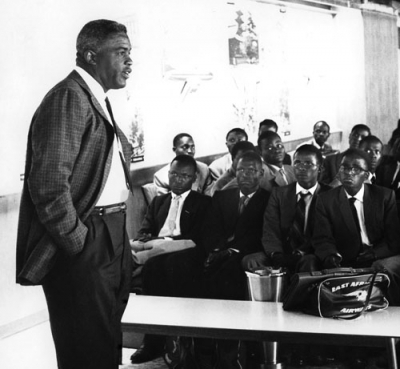 Sports legend Jackie Robinson, the man who integrated major-league baseball, was an early supporter of the student airlifts. Along with Sidney Poitier and Harry Belafonte, he signed a fundraising letter spelling out “an urgent matter which we are confident will appeal to your sense of fair play.” Robinson also contributed thousands of dollars of his own money for scholarships for Kenyans. 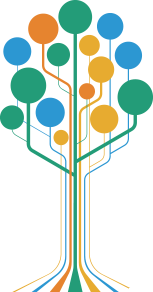 Since donations from individuals would not cover the cost of three planes, the organizers believed that only the U.S. government or large private foundations like Ford or Rockefeller could make an expanded program a reality. Jackie Robinson, now on the AASF board, was close to Vice President Richard M. Nixon, the presumptive Republican candidate for president in 1960, and that spring asked Nixon to reverse the State Department’s refusal to help the airlift. Despite Nixon’s eagerness to do so—he was the Republican elected official most knowledgeable and concerned about Africa—he made no headway. The large U.S.-based foundations also refused assistance. Singer Harry Belafonte, baseball player Jackie Robinson, and actor Sidney Poitier all signed a fundraising letter for the African students. The AASF then turned to Senator John F. Kennedy, chair of the Africa subcommittee of the Senate Foreign Relations Committee. Scheinman flew Mboya and his brother to Hyannisport in his own plane on July 26, 1960, a few days after Kennedy had become the Democratic presidential standard-bearer, to tell the candidate the airlift story and ask for support. Kennedy pledged to have his family foundation pay for the airlift, but wanted the pledge kept quiet. However, the AASF board was informed, and someone—Robinson, Scheinman believed—reached the Nixon campaign and, over a weekend, a Nixon associate persuaded the State Department to reverse its policy and offer to transport the students. Mboya, given a choice between the two offers, told Scheinman to take Kennedy’s, as it was more certain. On the Senate floor, Nixon ally Senator Hugh Scott of Pennsylvania accused Kennedy of using his money for the airlift in an effort to buy black votes. Scheinman and Montero supplied Kennedy with materials for a speech refuting Scott’s claim that the AASF was cavalierly refusing the State Department’s money. During the presidential campaign, the Kennedy forces emphasized his airlift support in African-American newspapers. This publicity was later deemed to have played a significant role in the black community’s high turnout for Kennedy in one of America’s closest presidential elections. In 1963, Belafonte, Scheinman, Montero, the Weisses, and other AASF board members attended the ceremonies to inaugurate an independent Kenya as the special invited guests of the new government. Sixty-seven-year-old Jomo Kenyatta became the country’s president, and Mboya, chosen to lead an important cabinet ministry, was widely viewed as a likely Kenyatta successor. The correspondence continued and widened. Through his relationship with Mboya, Scheinman extended his influence and interest to other African leaders such as Julius Nyerere, president of Tanzania, and Kenneth Kaunda, president of Zambia. Mboya also helped Scheinman emotionally through a divorce and the loss of his fortune, and into a new career as a stock analyst and a new marriage. In 1965, Mboya’s economic planning ministry issued African Socialism and Its Application to Planning in Kenya, a copy of which he sent to Scheinman. The “white paper” explained that African socialism was not the socialism so feared in the West, but rather a plan to ensure that poor farmers and low-wage Kenyans would not be shut out of property ownership and a route to better lives. Mboya was the most capitalistic of the senior ministers in Kenyatta’s cabinet. Kenyatta, who called the paper “our bible,” specifically said African socialism would not include nationalization of industries. The white paper’s toughest critic was Barack Obama Sr., who argued in a lengthy article in the July 1965 East Africa Journal that the plan did not go far enough in exploring ways to upgrade the lives of the poor. Obama had recently returned to Kenya after completing coursework for a doctorate in economics at Harvard, and had long since left behind the wife he had married in Hawaii and their child, Barack Obama II, whom he would see only once more, during a month’s stay when the younger Obama was ten. On the basis of Obama Sr.’s critique of the white paper, Mboya hired him for the ministry. Gordon Hagberg, a former consular official in Nairobi who by 1966 was overseeing the student airlift program for the Institute for International Education, sent Scheinman a list of the positions in Kenya then filled by thirty-six men and women from the 1959 airlift: “It is quite an impressive list, and fully justifies your foresight in taking early action to help meet Kenya’s critical manpower needs.” The airliftees were becoming the founding fathers and mothers of Kenya: members of parliament, cabinet secretaries, founders of colleges, university departments, medical clinics, engineering firms, conservation districts, communications businesses, and international banks. The airliftees also changed American culture. In a dozen instances, they were the first dark-skinned students to reside on a campus, and, because of how readily they were able to fit into the schools and the nearby neighborhoods, they smoothed the way for those campuses to then matriculate African-Americans, and truly integrate. Over time, Americans’ willingness to educate an entire generation of East Africans influenced their countries in ways that successfully countered Soviet influence, tilting those countries to the West for the next fifty years. By chance, on July 5, 1969, Barack Obama Sr. was the last person to whom Mboya spoke, on the sidewalk outside a pharmacy in Nairobi, before the minister was assassinated. The ostensible murderer was soon found, convicted, and hanged, but Mboya associates continued to believe that his death had been politically motivated and planned, to prevent the very popular Mboya from supplanting Kenyatta. 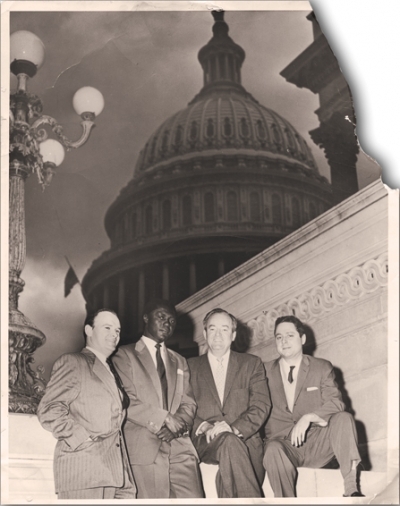 Civil rights activist George Houser, Tom Mboya, Senator Hubert Humphrey, and Bill Scheinman sit on the steps of the U.S. Capitol in May 1959. In these things we believe, our firm resolve and our deep concern for the less privileged in Africa and in the world—we dedicate this photograph. Our friendship and your human and generous sympathy and understanding is impossible to repay in any form except I hope by justifying your trust and faith. To this end I will totally commit myself till VICTORY and FREEDOM be ours. Like every other human being we all have weaknesses, but at least it will never be said that we did not make our contribution. After Mboya’s death, Scheinman continued to care for Mboya’s family, monetarily and in other ways, while working as a stock analyst and writing the 1970 best-seller Why Most Investors Are Mostly Wrong Most of the Time. He restored his fortune and visited Africa yearly. In the 1980s he tried to spur Kenya to begin fish farming of the Nile perch in Lake Victoria, meeting with representatives of the Gorton’s seafood company and with research scientists from American universities to determine if the enterprise could be commercially viable and environmentally neutral. Upon Scheinman’s death in 1999, his family took his ashes to Kenya and buried them on Rusinga Island in Lake Victoria, next to Tom Mboya’s mausoleum. Available from the Hoover Press is Law and Economics in Developing Countries, by Edgardo Buscaglia and William Ratliff. To order, call 800.935.2882 or visit www.hooverpress.org.